If you run a micro-business, you're likely stuffing your receipts into a file cabinet and hauling them all out at tax time for your accountant to sort out. But there’s a better way. These mobile apps let you take a picture of your receipt and save it to an expense entry. It's important to look for a package that lets you take a pictorial record of your receipts for a couple of reasons. First, it helps you organize yourself at tax time. It will take you minutes to generate the necessary reports for your accountant as opposed to days of receipt-entering. Secondly, a photo record of your receipts is added insurance against fire, flooding, or other potential calamities that your receipt collection may run into. 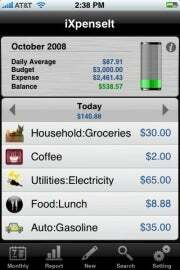 iXpenseit is one of the best-reviewed expense apps in the App Store. The Dashboard section makes it easy to find an expense by account, category, vendor, and payment method. The capability to enter budgets lets you figure out quickly if you can afford that latte. Who It's for: Sales reps, small business owners, and even someone trying to keep track of a household budget. Larger businesses may want something a bit more robust in the reports department. It’s only available for the iPhone. Expensify is purpose-built to handle expense reports, and it has a couple of standout features. Its SmartScan technology scans a receipt and reads all of the information to an expense entry automatically. You can do 10 of these a month for free. When you go over the limit, it's 20 cents per scan. Expensify syncs with QuickBooks. Its recent update for iPhone, Android and Windows Phone allows you to see your history, add expenses to reports, and submit expense reports from within the app. It has also added GPS mileage tracking across all application platforms. Just hit "Start" when your trip begins and "Stop" when you arrive at your destination. Who It's for: Expensify looks good for sales reps or anyone else who needs to fill out a proper expense report. As a receipt scanner for bookkeeping, the SmartScan technology can get a little expensive, but you can also take a normal picture of your receipt and enter the other information yourself. 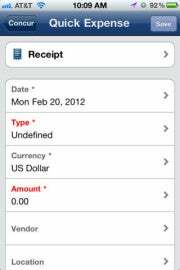 Expensify is available for iPad, iPhone, Android, BlackBerry, Windows Phone, and even Palm. Free to use as an individual (except if you go over the 10 a month SmartScan limit), $5 a month per user if you register as a company that needs to approve expense reports. You only pay for an individual when they use the app, handy feature if your company only puts personnel on the road a few times a year. Concur is a web-based solution for expense accounts of all sizes. Concur Breeze targets small business, and Concur Premier speaks to the needs of medium to large businesses. Both apps feature Salesforce integration, automatic notifications when a business credit card is used, and the ability to file and approve expense reports on the go. Who It's for: Concur's features come at a price, as it’s a high-end solution to the problem of improperly put-together expense reports. If this is important to your business you'll want to check it out, but if you run a micro-business, then you really don't need Concur's advanced reporting suite. Concur has apps for iPhone, iPad, Android and BlackBerry, as well as its web-based interface. Cost: Concur Breeze uses a monthly subscription model based on number of users, at $8 each. Concur Premier provides a customized quote based on the needs of the business. You can try Concur Breeze free for 30 days. Angela West is trying to reform her habit of stuffing receipts into a drawer until they reach a critical mass and start smoking. She's written for big insurance companies, small wildlife control businesses, gourmet food chains, and more. Follow her on Twitter at @angelawest and Facebook.